Since 1979, this artist duo have been creating video, installation work that has made a dramatic impact on temporal projects in gallery and studio space. From Switzerland, their work has been showcased internationally and seen by almost everyone in some way, shape or form. They pioneered the dimension of art which explores the situation of chain reactions as well as the embodying physical representations of Chaos Theory. As the camera pans from one station during the duration of the piece, each individual component feels as though it has it's own aesthetic exploration in material. Their use of fire is very stunning. I have always admired the practical drafting skills of an engineer or a mathematician. Whenever I look at books on physics or geology, I am fascinated with the complexity of the drawings often rendered. When the worlds of art and science collide, the potential for spectacular things is sure to result. 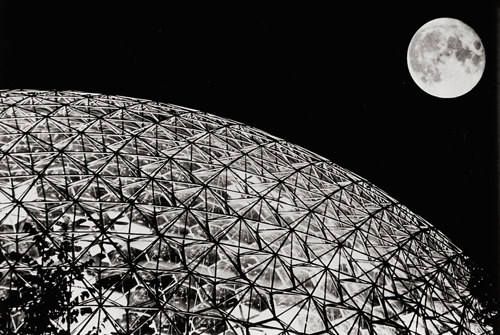 Case in point, the work of Buckminster Fuller who throughout the 20th Century had an incredible influence on design, architecture and the movement of futurism, is worth revisited for artists and designers alike. His designs border on aesthetic spontaneity, but revel in structural symmetry. 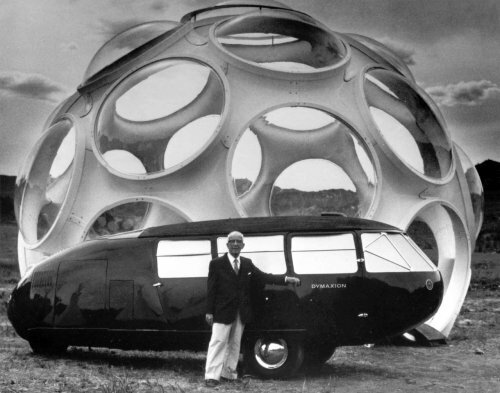 He is probably the most famous for his geodesic dome, which marked an incredible moment for civil engineering and architecture, the crossroads met through his conception of a far more dynamic space. Internationally renowned contemporary artist, Bill Viola has over the years continued the study of the medium of video art. The central focus of most of Viola's work has been universal human experiences including birth, death and the development of consciousness. Like many video artists during the 70s and 80s Viola's interest in Zen Buddhism has influenced the feats in which he attempts in many of his work. I enjoy a lot of Viola's work and appreciate their pursuits. For although he does not push his body to the degree of some of his peers like Vito Acconci or Chris Burden, his involvement is still very far reaching. Many of his videos involve water, which gives a temporal aesthetic that is visually activating. I can only imagine what witnessing one of his performances must be like. Parisian illustrator, Simon Goinard Phelipot's work is absolutely stunning. His images are evocative, contemplative and of course, narrative , like most illustration work. But where I find that Phelipot branches off is his ability to create very sensitive images. In the midst of fine, expressive brushstrokes as well as a skillful color palette, lies also the determination to create an introspection of the human figure. The people in his paintings are meant to be there, in that place and time. The environment around them feels as though they have grown in accordance to their participation. This unique quality gives much more to the viewer than simple narration, it gives them a ephemeral situation. Peter Jansen has made into reality what comic artist Schuiten and writer Peeters fantasized about in the book Nogegon. Try to guess what action this sculpture represents before clicking on the link below to see the rest of the artist's work. TREE HOUSE exhibition this Saturday! The Japanese artist is world-renowned as an illustrator and animator; often referred to as a "master" in the Illustration industry, his worked has been influential in many different genres of the art world, world wide. Some of his recent work includes the widely acclaimed animated stop-motion film Coraline!!! Uesugi is also involved with the fund-raising exhibitions/auctions for the Totoro Forest Foundation championed by Academy Award-winning filmmaker Hayao Miyazaki. Tadahiro Uesugi | Tree Crack | Digital print, Edition 1/1 | 20" X 13"
Tadahiro Uesugi | Tree House | Digital print, Edition 1/1 | 20" X 13"
Who is currently working as an animator, illustrator, and designer. Appelhans work includes production and character design for animated feature Monster House and also for Coraline. His published work includes the comic Frank and Frank, and he contributes regularly to the Flight comic anthologies. Having done freelance work for several major motion pictures studios, his past clients include Sony, Dreamworks, BlueSky, Interplay, and Mattel. For previews to Chris Appelhans, more on Tadahiro Uesugi, and other artists in TREE HOUSE, sign up for our exclusive online preview here. We hope to see you guys take the opportunity to see the work of some of the best artists in the industryat the OPENING NIGHT of TREE HOUSE, This Saturday @ 7:00 pm! The opening night of SWEET STREETS at Nucleus on 8/29 is just around the corner & the co-curator of SWEET STREETS, CARO has created a one of kind CD Sampler: "Sweet Streets Vol.1" featuring music from Japan's own underground scene. This CD comes FREE with any in-store purchase. Come out and celebrate Sweet Streets at Nucleus on 8/29 @ 7:00 pm- 12:00 am and take advantage of this great opportunity to take home some Japanese street scene inspiration! For more info go to our website here or stop by Hi-Fructose's site here. This video was made by Passion Pictures, with backgrounds by Alberto Mielgo. When I saw this, I could immediately tell it had the hand of Robert Valley in it. I have been a huge fan of his illustrations and character designs for some time and feels he is one of those artists that has worked in the industry for years and deserves a bit more recognition. Ryan Browning's paintings consist of ambient geometric forms in landscapes that make me think of Caspar Friedrich. Mind you, this is only a mild reference as Browning creates three dimensional shapes that intervene with the environment rather than glorify it. Its not to say that Browning's work is violent because there exists a playful melody which perpetuates their growth. I don't know how many of you have ever grown sugar crystals in flasks, but the same effect is translating. 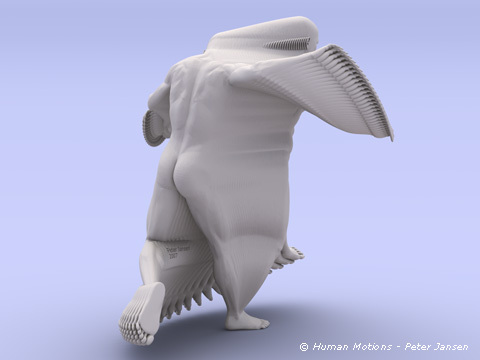 These forms are alive: moving, pulsating and free.